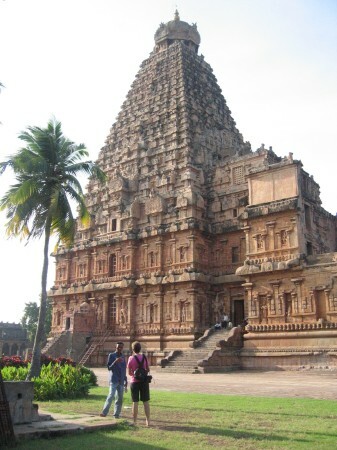 Brahadisvara temple, Thanjavur,was built by Rajaraja Chola in 10th Cent AD. This celebrated Saiva temple, appropriately called Brihadisvara and Daksinameru, is the grandest creation of the Chola emperor Rajaraja (AD 985-1012). The temple is within a spacious inner prakara of 240.90 m long (east-west) and 122m broad (north-south), with a gopura at the east and three other ordinary torana entrances one at each lateral sides and the third at rear. The prakara is surrounded by a double-storeyed malika with parivaralayas.